I don't know what it is...but when a woman gets her nails and toes done she feels like a brand new woman! lol. It's crazy...but a little nail polish could go a long way. 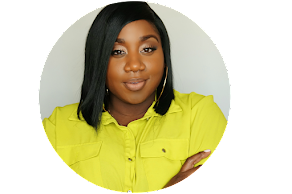 No one knows this better than Nail Artist and Designer Dominque Renee. Trust me when I say, no one out there is doing it like her. Dominque's designs are funky, edgy and are definitely attention getter's...the leopard set has my attention right now...hello! lol. Check out her dope nail designs and find out where she gets her inspiration. Tell us, how did you get started? I started designing nails after seeing Solange Knowles do a post on MySpace about her love for nail art. She posted pictures of some of her favorite designs, and I was in complete awe. I had never seen anything like it! From then on I never looked at nail art the same. However, I was unable to find salons or technicians that were able to do what I wanted done, and the rest is history. How in the world do you think of these beautiful designs? Designing comes to me naturally.. as I'm watching TV, or looking at something I've seen a million times. Something just clicks.. and I'll either make a note of it or grab a pencil and pad and sketch. I am inspired by any and EVERYTHING!! Inspiration is all around me.. I am obsessed with fashion and art from the 80s and 90s so I watch a lot of old shows, music videos, movies etc. and I LOVE patterns. I'm also inspired by words, emotions, and thoughts. I then visually communicate them through my designs. A lot of your designs have this 80’s 90’s retro funk to them. Do you have plans to create for any other eras? You are very young, and have accomplished a lot. I see you have expanded your vision to include jewelry. How did that come about? I knew that nails were just the beginning for me. Jewelry has always been a part of my vision, I never saw myself as just a nail artist. What’s next for Dominque Renee? What's next for me? I'm getting ready to go to school to get my certification in Nail Technology. Once I finish the program I plan to either open up my first salon, or sign with an agency and do lots of runway, editorial, and media work. In the meantime I am working on my Spring/Summer collection and trying to get my products into shops and boutiques all over the US. Oh…before I forget….tell us 5 things about you that you haven’t told on any other interview…no matter how weird it might be…lol. 2. I used to be OBSESSED with hello kitty. 3. I can find humor in almost anything..
4. My favorite thing to say is "ewww"
Thanks for this opportunity, and your kind words!